Peacetown is a party for the people and by the people. Join the community for the Peacetown Summer Series featuring Big Brother & the Holding Company, w/Songs of Janis Joplin, and opening act THUGZ! Our Peacetown Summer Concert Series has become a happy summer time tradition, with two great bands every week stirring up the good vibes at Ives Park in Sebastopol from 5:00-8:00pm every Wednesday. 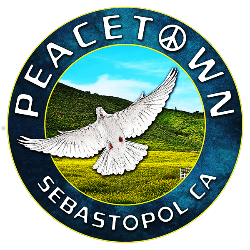 The City of Sebastopol and local sponsors help the cause, but it is the Citizens of Peacetown with their generous donations of whatever they can give, that put the party over the top. Peacetown is a party for the people and by the people. Please become a Citizen of Peacetown and help us throw the party by making a donation of any size. Last year the Mr. Music Foundation Provided classroom music to 2500 school kids per week. Started "Ukes in Schools Program" for elementary schools. Employed over 100 musicians for local concerts. Raised $35K during benefit concerts for fire victims. Produced the local Women's March & donated to the Living Room. Supported our local police and fire department and first responders. Brought great music to our community all year around. THANKS FOR HELPING US BRINGING THE PARTY! Bring good vibes, lowback chairs and dancing shoes!